The stunning amount of delicate detail in every Nao Tsukiji illustration is a thing of beauty, and to see that level of artistry in page after page of Nao Tsukiji Illustrations NOSTALGIA is almost overwhelming. Up until this point the best way to collect her art works was through her doujinshi stationary, but finally a substantial amount of her work has all been collected in an art book. 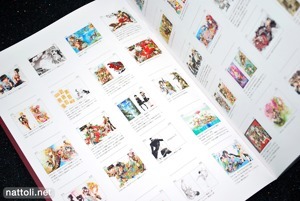 As hard as it may be to believe even in a 160-page A4-sized art book, this is in no way a comprehensive collection, as many familiar fan art works were excluded leaving room only for Nao Tsukiji's original works. The cover and the first illustration in the art book are newly drawn for this collection, but aside from those two the rest are from previously published works ranging from 2001 to 2010. Nao Tsukiji's style is really unique among mainstream Japanese artists. The period clothing is based on turn of the century (though in some cases earlier) Japanese and European fashions, but decorated with a fantasy flair that helps make her illustrations so distinct. The first 57-pages of Nao Tsukiji Illustrations NOSTALGIA features exclusively illustrations that were done for magazines. One re-occurring character in the book is a gun-wielding Little Red Riding Hood, who appears three times throughout this collection. 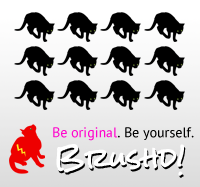 Nearly every illustration receives a full-page, and there are several two-page spread illustrations. It's kind of a shame, because they aren't printed with any overlap in most cases, and most would have looked good on a single page horizontally. The second chapter of the book is titled Works for Comics, and features the only six monochrome illustrations in the book. The comics section also features more of Nao Tsukiji's feminine-looking male characters from Adekan (艶漢) and Kiniro Kishi (金色騎士). Although the Works for Comics section may seem short---running from pages 58 through 79---many of her comic illustrations were done for magazines, so they appear in the first chapter under Works for Magazines. The last section of the book is the largest, running from pages 81 through 155, and is titled Works for Indie Letter Papers. 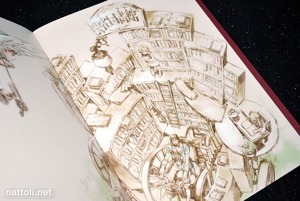 Many of the illustrations preserve the feel of their original presentation, with lines and spaces for writing underneath and around the illustrations. These are also some of the most intricate illustrations in the book, with decorated hair styles and clothing that morphs into architecture in such a way that it's hard to pinpoint the divide. Several of the illustrations under Works for Indie Letter Papers are done in a portrait style, framing the girls in jewels and nature in amazingly decorative ways. Some of the other illustration explore an art nouveau style with borders and frames integrated into the art works. The variety is quite impressive. Nao Tsukiji Illustrations NOSTALGIA is packed from start to finish, leaving only five pages for the thumbnail index and copyrights. Nao Tsukiji comments on some of the illustrations but not all in the index. This really is a great illustration collection, with art work so detailed you might just discover something new with each glance. Oooh, this looks excellent. 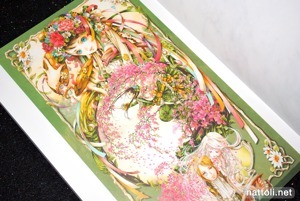 And it's a bit unusual for an artist with that sort of style to get an artbook like this, hmm? Wonderful. Wow, this is really hot! Didn't notice this one before! Just received it today! Well worth the money! 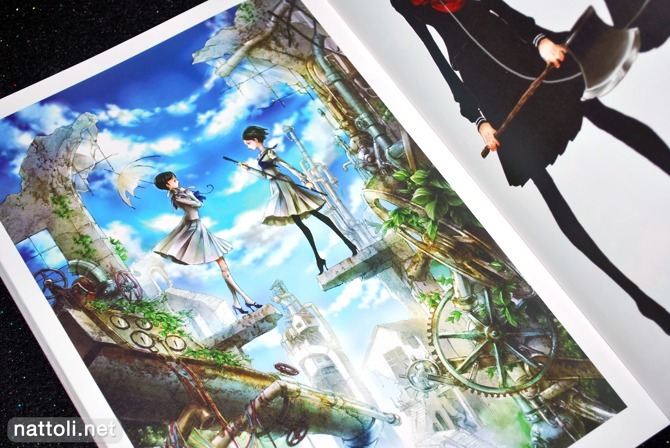 This art book will not disappoint! OMG thank you for this review O.o I always loved her art and I am so happy to hear there is an Artbook out there finally. I really need this one. 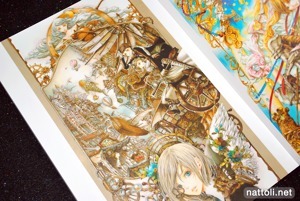 btw, is it a regular-release artbook, that is available through other places than Amazon Japan too? Yup, it's a regular commercial release. Import retail shops should be getting theirs shortly, and other export ones like HMV, and CDJapan should have it already. 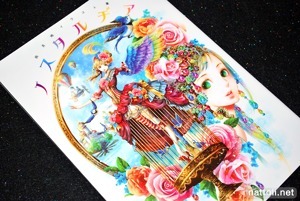 It's cool to see Nao Tsukiji finally get her own art book after seeing her art for so long in stationery. I discovered her art way back around 2001 and it still amazes me now. I have an older Final Fantasy VIII sheet she drew in '98 and though it's her hand which drew it, it doesn't have all the intricate details as her normal art. Fascinating to compare both her simplistic art and this detailed type. 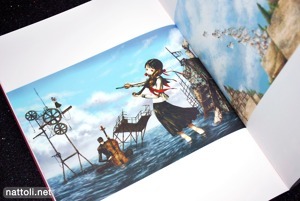 Is there a reason why an art book was released? Is she making a new series or something like that? I don't know the reason, her most recent manga volume release for 艶漢 had a similar release date to the book. So maybe it's doing well enough on its own to drum up sales for the art book. Hi Bookfan! Can you please show me that "Final Fantasy VIII sheet" you were talking about in this message?